50 BRITANNIA SQUARE is also known as The Old Vicarage and originally Oversley House. Following the 1817 William Handy auction of building plots, the reference to the first owner, John Newman MD, is in the lease dated 24 March 1819, so I assume building commenced soon after that date. I know it was occupied by 1821. It appears on the 1822 “Mainley” map. It’s not clear how we managed to have a double plot, but I assume that Mr Newman bought two plots at the auction, possibly intending to live in one and develop and sell the second; however, by whatever means, we have a big side garden as a result.It remained in Newman family until approximately 1860. In 1867, a new owner, Thomas Westcombe, and his sisters are recorded. 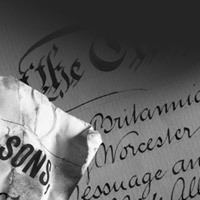 Mr Westcombe is described as Accountant and Secretary to Worcester Opthalmic Hospital. The Westcombe’s originate in the village of Oversley (between Alcester and Stratford); hence we assume the source of the name Oversley House, which is used until at least 1922. He was apparently an amateur botanist and early plans show a considerable area of glasshouses in the side garden. Both John Newman and Thomas Westcombe were leading members of the Quaker community in Worcester.In 1905 a new owner, Mrs Georgina Horne, is recorded.In 1922, the property became the vicarage of St Mary’s church, with the vicar being Rev Herbert Gresley Elton MA (Oxon). Several succeeding vicars are recorded: Rev Samuel Wallis Frost, Rev Gilbert Lionel Michell and, finally, Rev Douglas Beard who lived here until the mid-1950s. We have met Rev Beard’s daughter and she has given us an interesting insight into her life growing up in a draughty old vicarage after the war, including her mother growing potatoes in the garden under the “dig for victory” scheme. After St Mary’s church was amalgamated with St George’s, the vicarage was disposed of by the church, but not before it was taken over by squatters for several months. They are reported as having “improved it” during their time here! Since then, it has apparently seen several owners including a second-hand car salesman and the headmistress of Sunnyside prep school.John and Maureen Ball and family have lived here since 1989.